Air Vision introduces a new line of air curtains with an elegant modern design that offers an optimum combination of low noise level, sufficient airflow and minimal turbulence. The air Curtain is designed for use above entry doors as well industrial doors with heights up to 18 feet. To prevent warm air infiltration in cold shops and doors less reach-in refrigerated cases. To keep out fumed, dust and insects, maintaining a clean environment. To invite customers in by allowing entry doors to stay open. Air Vision Air Curtains significantly reduce energy consumption especially when there is a substantial temperature difference between inside and outside air. >> Areas with high humidity environment. >> Hazardous area with flame proof motors. It is imperative that proper space is available for installation of an Air Curtain. All Air Vision Air Curtains are provide with 6 to 8 base metal plates with rubber padded bushings. Screws (12 to 16) 5”/32” are required to mount these plates on to the support. 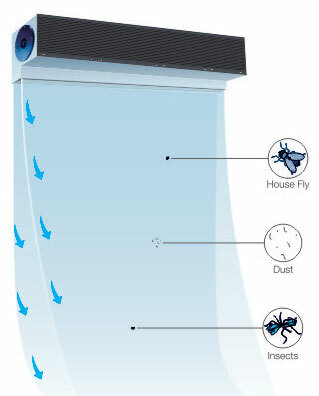 All Air Vision Air Curtains will require a ||| phase or single phase power supply connection within one meter of installation site. Custom built Air Curtains can also be provided. Casing: MS / GI / SS powder coating for corrosion free life in 16, 18 and 20 Gauge construction. It has a unique computer designed scroll with one piece plenum. Louvers: Specially designed M.S. powder coated louvers to direct air flow for effective air barriers. Grills: suction grills made of high grade engineering polymers. Turbo: 9”ø Aluminium statically and dynamically balanced forward curve impellers. Alignment: A totally new concepts, designed to ensure 100 % alignment at factory leading to efficient usage of impellers and motors. Sabbs: Specially lubricated SAB bearings for smoother quieter and longer life.